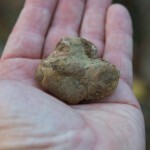 Well not exactly gold but at €5,000 a kilo the famous Alba white truffle is worth getting your hands dirty for. It’s one of life’s luxuries and I love them but unfortunately we usually have to make do with the black variety that are a fraction of the cost. Where to find the best is, not surprisingly a closely guarded secret. But even if you did know a special, highly trained dog is essential equipment. 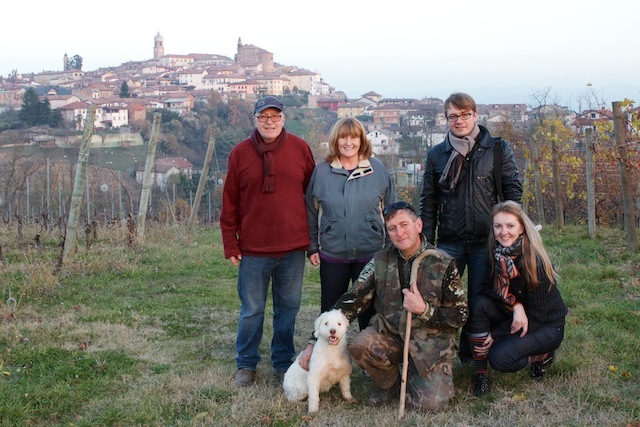 I often wondered how it’s done and now I know, after a splendid afternoon tagging along with one of Travel Langhe‘s tours in the woods behind La Morra. 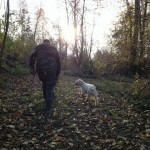 Marco Varaldo was a delightful host and his young white dog showed all the exuberance and enthusiasm of youth. 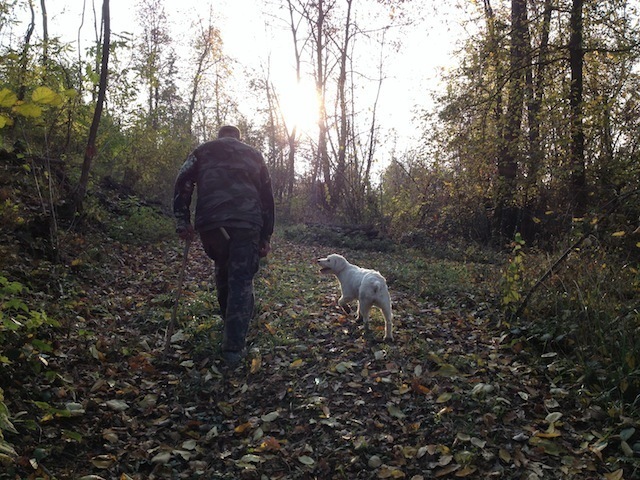 Incidentally most truffle dogs are white so they can be better spotted at night when the really serious stuff takes place. 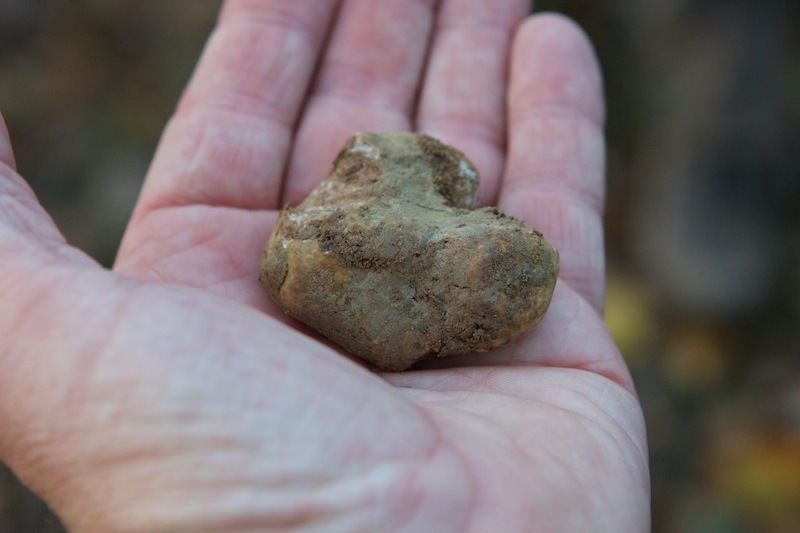 That’s not say that you can’t find truffles on the well-trodden woodland paths but they obviously get well “dug”. Nevertheless our search proved successful and it wasn’t long before a very excited dog began digging frantically and Marco was quickly on his knees, restraining the dog while gently probing the earth with his special tool. A couple of blacks only worth using as treats for the dogs were followed by the real thing. Slightly smaller than a golfball but worth more than a gross of Titlelist ProV1’s. We got to hold, examine and sniff it but unfortunately not to taste as it was destined for a local restaurant. I am sure we must have some around our house with our old oaks and hazelnuts as there are occasional unexplained holes. We must get one of the locals to pop round with their dog during the day rather than uninvited by night. Unfortunately the only things that excite our dogs are cats, pheasants and the occasional vehicle on the drive. Truffle dogs are literally worth their weight in gold. p.s. I was horrified to see one in the recent Italy Unpacked programme on BBC wearing a muzzle as some unscrupulous hunters sometimes leave out poisoned meat to snuff out the competition.